Casemiro will play instead of Kroos and Varane instead of Pepe. As for the game itself, expect our creativity to drop dramatically with James sidelined. Still, I believe we have enough firepower to win this. I *bleep* hate the international break. Every single time, it's us who get hurt the most. I hope James' injury isn't serious and that he'll be back in no time. We should grant him a honorary membership. We should be relatively fine with the squad we have. 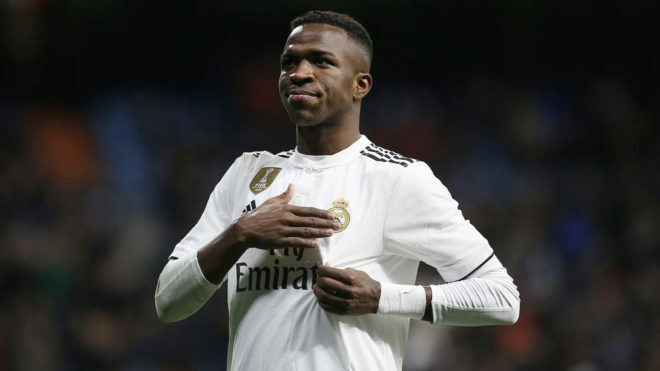 Dani to replace Danilo and Isco to replace James. Unless, of course, Espanyol is secretly really good at playing football and is just waiting to meet us. They're a very good side, that's undeniable. But Rafa has no excuse to mess up. He has a WC squad and must win this. Confirmed Lineup: Keylor Navas, Carvajal, Pepe, Sergio Ramos, Marcelo, Casemiro, Modric, Isco, Bale, Cristiano and Benzema. Casemiro is everything Benitez love tbh lol. And he had a fantastic season at Porto. Yes. That sight last season of Kroos and Modric running in fumes wasn't pleasant at all. Rafa seems better than Carlo in that department but I don't know why he didn't want to rotate Danilo with Carvajal. Only when the former got injured that the latter got to play again. Well, 4-0 within 28 minutes, Ronaldo with a trick, Benzema with a tap in. I guess this match is relatively over. I was thinking the opposite re Navas' long kicks. When Iker rarely made them, he always has a target in mind. Where are all the Benitez critics now? 3 games in Señor Bill, the critics would be in full swing when we draw or lose. I like that the players are responding well to what Rafa wants, may we keep up the good work. Calm your horses, come back with this statement when we win a major trophy. As things stand, he still hasn't proven anything. Allowed to ease in this season. We usually play the supercup to start the season against Barca or Atleti and then have a key game early too... not this one. Easy opponents to start. Didn't have to face trial by fire going in. Has there ever been a question about how we do against weak opposition? No, this is just another throwaway game where Ronaldo can add to his goal tally. Well, we did question when we drew against Sporting and we would question when we drop points against weak opposition. So to answer the (rhetorical?) statement, yes, we question it. Excellent game, loved it from start to finish, the moment someone lost their concentration (Ramos) off they went and a fresh player came on. So kudos to Benitez for that.